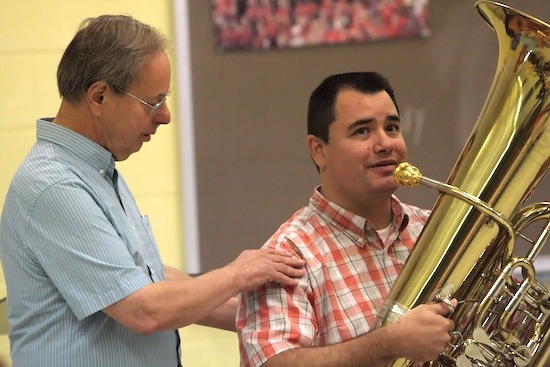 Robert Rickover, Alexander Technique teacher, working with a musician. Maybe you’ve heard of the Alexander Technique somewhere along your musical journey. If so, you’re probably aware that it has something to do with helping relieve excess tension. Perhaps you’ve seen people lying down on the floor with books behind their heads, or an Alexander teacher working with a student, and you’ve wondered what they were doing. Most importantly, you may have asked, “Can these ultra-subtle-looking activities help me play my instrument or sing better?” Yes, definitely! Whether you’re having some kind of pain with playing, tension that you know isn’t working for you, or are just interested in playing with more freedom and ease, the Alexander Technique can help. For me, it forever changed the way I approached playing violin –– as well as singing, walking, sitting, and breathing, for that matter. Around the turn of the last century, F.M. Alexander, an Australian actor, suffered from chronic hoarseness whenever he performed. Through very careful self-observation, he discovered that he slipped into a pattern of unhelpful whole-body tension, similar to a tiny version of a baby’s startle response, even before he started to recite his Shakespearean monologues. Alexander noticed that this tension began with his thoughts about performing. He also noticed that he had to first stop his pattern of tension before trying replace it with a more useful behavior. He found that his head and neck were crucial to controlling this whole-body pattern. When he stopped or “inhibited” the downwards and backwards tension of his head on his neck, it helped to unlock this overall body pattern of tension. Then, he found a helpful way to use his mind: he thought of his body as having inner directions. These can be summed up as, “I will allow my neck to be free, and my back to lengthen and widen, so that my arms and legs can come away from my body, my knees can come away from each other, and my heels can go back and down.” He found that he could use these internal thoughts in any activity he was doing. This meant that he could have just the right amount of muscular tension in any position. Often, we can get caught in thinking there is one magic posture for each activity that we just need to tighten ourselves into and then we will be “right.” No matter what it is that we do, though, a single posture doesn’t work past bowing the first downbow, singing the first note, breathing after the first phrase, conducting the first downbeat, or typing the first five minutes of your homework. In the Alexander Technique, there is no one cure-all posture into which you can sit or stand up straight. Instead, you learn how to use your senses to stop subtly distorting your body with tension, and to allow your body to use its own inner support structure. Learning to include the entire body along with your breathing saves a lot of time in correcting many problems at once. It’s especially important as a student to learn how to improve your body’s use because when you’re not in the practice room, you’re at the computer or typing on your phone. This can be a prime recipe for pain and discomfort if you’re not prepared! Learning the basics of Alexander Technique now, at the beginning of your musical career, will save you years of undoing bad habits later as well as prevent injury over your lifetime. Most importantly, it will help you make breakthroughs in your music learning while feeling your best. Many schools offer group classes as a part of their coursework. If this is true for your school, take advantage of it! Diana Rumrill is a physical therapist; soon-to-be certified Alexander Technique teacher; violinist; and singer in Washington, DC. She attended the University of Connecticut for physical therapy, the Hartt School of Music for voice, and the Philadelphia School for the Alexander Technique. Find out how to work with her at harmoniousbodies, and follow @DianaRumrill on Twitter. For additional information about the use of Alexander Technique for musicians, check Robert Rickover’s site, Musicians and the Alexander Technique. To find teachers certified teachers of the Alexander Technique in your area, visit American Society for the Alexander Technique or Alexander Technique International. What a wonderful article! And featuring two Alexander teachers I’ve studied with! I’m so glad a website about majoring in music has information about the Alexander Technique. Several musicians in the orchestra in which I play (violin) have had lessons and suggested I do the same. I was fairly skeptical at first, but eventually decided to attend a workshop where Michael Frederick was teaching and that made a big difference in my playing. Much less shoulder pain and by all accounts a better sound. Later, i was fortunate enough to begin private lessons with Robert Rickover during one of his regular visits to Toronto and each time I see him for a few lessons, by playing improves and at this point the pain is completely gone.